Though Cortès painted Paris time and time again, each depiction remains unique and portrays the changes brought by time and the seasons. In response to a question asking him why he painted Paris so much, Cortès replied, “Because I adore Paris, and because wherever one turns there is something to put on canvas.” This admiration is seen in his vibrant depictions of the capital, like here, full of life and light. Edouard Leon Cortès was born in 1882 at Lagny a few miles east of Paris. It was an exciting epoch: art, Literature, music and political thought reached a pinnacle of creativity, allowing new schools of artistic expression to evolve. With this revitalized attitude towards new ways of seeing art, experimenting with colour, depth and perspective, Edouard Cortès became enraptured with the idea of becoming a professional painter. At the young age of 17 Cortès began formal studies at the École des Beaux-Arts in Paris and for five years he expanded his horizons in the fields of classical and impressionistic art. He was a Member of the Society of French Artists and made his debut in Paris in 1907, introducing a style which was considered to be a breath of fresh air and highly individual. As an artist, Edouard Cortès sought to discover the unperceived aspects of nature and man; those special atmospheric qualities of mist in the air, the afternoon sun, evening shadows, rattling carriages and bookstalls along the quays of the river Seine. Cortès captured in oils the unique and magical light of Paris. In some paintings his stonework seems almost to “weather” before our eyes and in others it glistens like pearls against a summer sky. In evening compositions night falls like a gentle veil, wistful and wreath-like, holding intact shadows of the night. 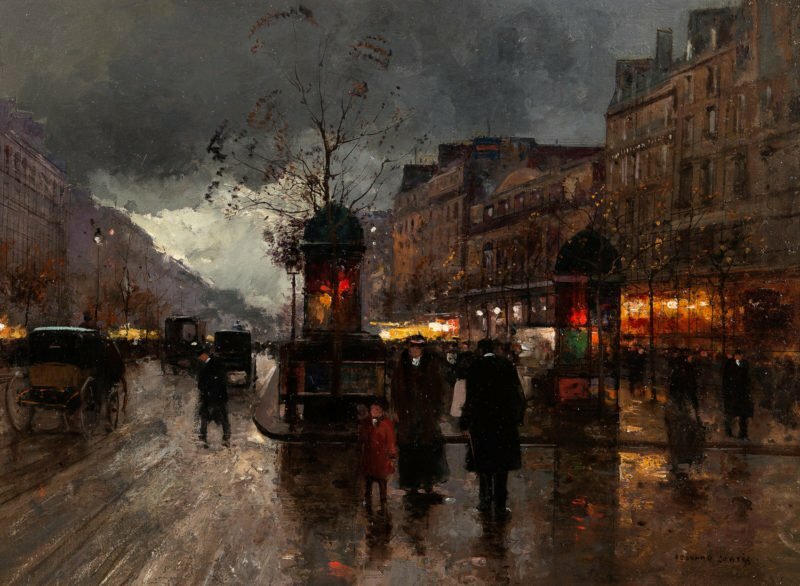 Edouard Cortès windows shine brightly, blazing with his lamps glowing, signs shimmer and streets appear wet from a sultry nocturnal rain.